In the last post we looked at some ways to learn new words – reading with context, flashcards, word group lists and studying by comparing words. We had discussed about identifying words that are confused easily. 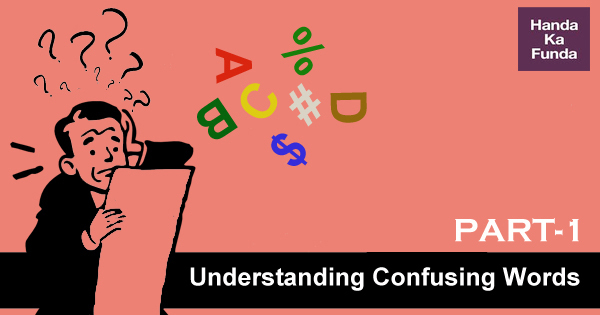 In this post we will look at some examples involving these confusing words. Now, will a misunderstanding cost you marks in the exam? Not necessarily so, because like we discussed last time, no questions simply ask for meanings of words. However, when you’re reading a block of text and reach this word where you are not quite sure of the meaning, that is enough to cause a problem. The best thing to do next is read these words, understand the subtle difference, use it in a sentence or two and you’re good to go! Lie vs. Lay – An easy rule of thumb is to replace the words with sit and set. If sit makes sense (e.g., sit down) then lie should be used (lie down). If the sentence works with set (e.g., set the book on the table) then lay should be used (lay the book on the table). It’s vs. Its – When you don’t want to say ‘It is’ say ‘It’s’. Affect vs. Effect – The verb affect means “to influence something”, and the noun effect means “the result of”. Try to remember it in the following manner: If something affects you it usually has an effect on you.What is the effect of demonetization on the economy? Did it affect the poor adversely? Then vs. Than – Than is for comparing things. Then is for showing a sequence of events. He said “I am thinner than a stick” and then gobbled up his sandwich. Insure vs. Ensure vs. Assure – To assure is purely to intend to give the listener confidence, to ensure is to make certain of, and to insure is to purchase insurance. So when you go to the minister and submit a grievance, he will assure you that someone will look into the matter. Then he asks the officer on duty to ensure that the problem is solved. Stationary vs. Stationery – Stationary means “fixed in one place and not moving,” like a stationary lamp-post or building. Stationery refers to materials used in writing, such as paper, pens, pencils, and ink. Isle vs Aisle – Both are pronounced the same way but an isle is an island. An aisle is a corridor through which one may pass from one place to another. Adverse vs. Averse – Adverse means unfavorable, contrary or hostile. Averse means having a strong feeling of opposition. An easy way to remember is that you can substitute ‘harsh’ in place of adverse and the meaning should not change. e.g. They sailed despite adverse weather conditions. Credible vs. Credulous – Something that is credible is capable of being believed. If your friend tells you about this report that eating cupcakes makes you taller, you know that the source is not credible. ‘Credible’ can apply to both things and people. Credulous means having or showing too great a readiness to believe things. Someone who is credulous is too willing to believe and hence easily tricked or taken advantage of. Tortuous vs.Torturous – Tortuous means ‘full of twists and turns’, as in: The travellers took a tortuous route. Torturous means ‘involving or causing torture’, as in: They had a torturous five days of fitness training. Disinterested vs. Uninterested – If you’re disinterested, you’re unbiased. A judge in the courtroom must be unbiased so she can be disinterested. Appraise vs. Apprise – To appraise is to estimate the value of something, for e.g. “the interviewer’s job is to appraise and evaluate.” On the other hand, apprise means to tell or letting people know about things. Remember that in companies you have an appraisal meeting with your manager where she evaluates your performance and gives you feedback.But if you are late for this meeting, you are supposed to apprise her of the same. If you read the last 10 words in this set, now is a good time to try to recall them and run them once in your head. But why do this? Simply because, new words are easy to remember the first time, but if you don’t familiarize yourself with them, very soon you will forget all the new words you learnt. Enervate vs. Energize – Enervate means to sap off energy or strength. It is the opposite of energize. So long lectures can enervate you, while a glucose drink will energize you. Fortuitous vs. Fortunate – Fortunate is lucky, but fortuitous means by chance or accident. Fortuitous is closer to serendipity which also means by chance. A news report said “More fortunate refugees have been taken in by local families.” However, meeting a friend from school at the movie theatre is a fortuitous event. Invoke vs. Evoke – The word evoke means to bring something forth or to recall something to the conscious mind. It typically implies some type of emotion, imagery, or memory. For e.g. The comic strip will evoke laughter from its audience or This painting evokes childhood memories. The definition of invoke has a number of meanings, including to assert (something) as authority, to appeal (to someone or a higher power) for help, or to conjure up (to invoke spirits of the past). For e.g. The president invoked martial law to stop the protests or He invoked the law to win the case. Ambiguous vs. Ambivalent – Even though the prefix “ambi-” means both, ambiguous has come to mean unclear or undefined. For e.g. The election law is written in an ill-defined, ambiguous way. If you are ambivalent about something, your feelings about it are contradictory or mixed: you feel two (or more) ways about it. For e.g. She’s deeply ambivalent about the issue and can argue both sides very effectively. When choosing between ambiguous and ambivalent, consider whether you are describing something that is unclear or vague: that’s ambiguous. If it’s a fluctuation in attitude or feeling, that’s ambivalent. Paramount vs Tantamount – Paramount means best. Something that is paramount is of chief concern or supreme in rank. The word is often used in somewhat redundant phrases such as of paramount importance. For e.g. The best interests of the client are paramount. Tantamount means equivalent. It describes the relationship between two things rather than the status of a single thing. For e.g. Breaking off negotiations at this point is tantamount to a declaration of war. So that’s all for now. We will continue with more such words in the next post. Sir, versus and verses are also homonyms.